There’ve been two public holidays in Spain this week; Wednesday the 6th and Friday 8th December to mark the Spanish constitution and the immaculate conception(!) respectively. So to celebrate, Vejer went into ‘Pueblo Abierto’ (Open Village) mode, flinging back the doors of her monuments and putting on a Ruta de Tapas (tapas route). During the Ruta de Tapas 12 restaurants put up their best little dishes for sale at 3€ (including a drink) and hundreds of people try to taste them all within the 8 hour over 2 days time frame. There’s a tapas route map which you need to get stamped in every establishment you eat at – if you get the full set of stamps you can vote for your favourite dish and enter a competition to win a computer. Tasty and hectic, start early! 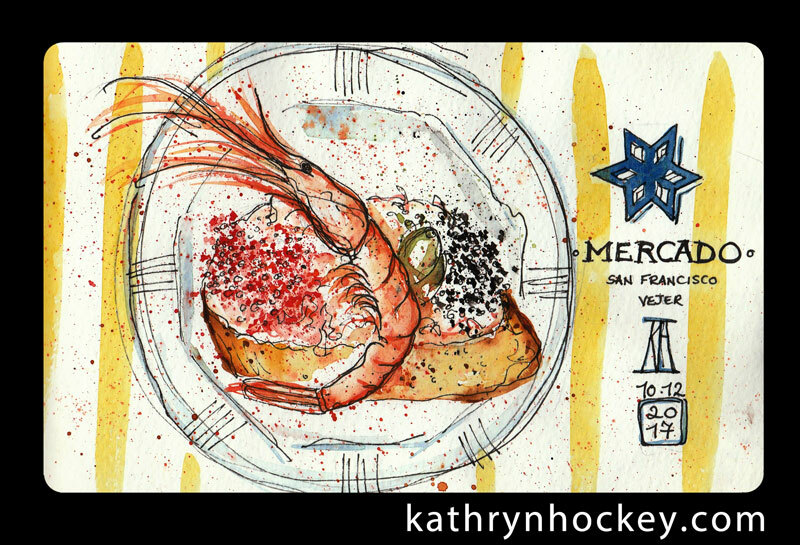 The Vejer Sketchers arranged a meeting on Saturday so I popped into town with the intention of sketching (and eating) food in tapas form. First stop the market (below)…not strictly part of the official tapas route but hey ho, the only place open when I started sketching. I didn’t eat this one, the roe was pretty but not gastronomically appealing so I gave it back unsullied to the fish counter lady once the sketch was finished. 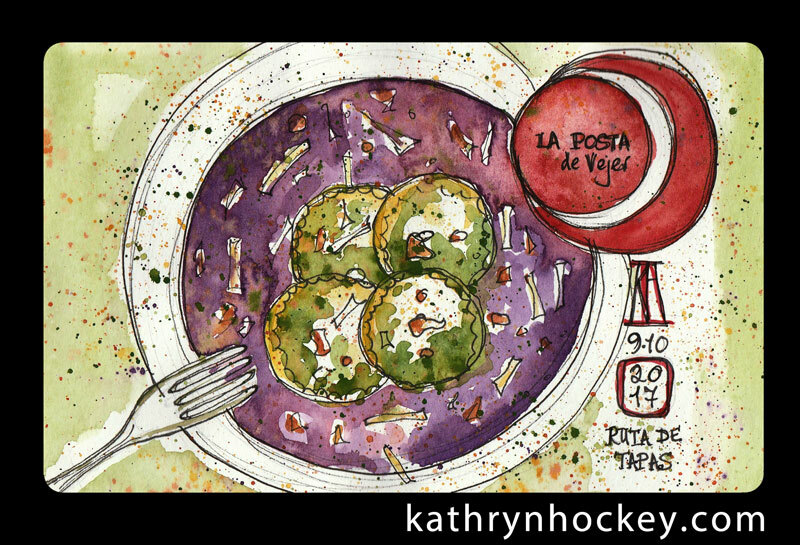 Confession time: I ran out of steam and didn’t draw the last dish I ate…the establishment was struggling under the weight of the hoard by then so it took a long time to procure said tapas, which although delicious was not pretty! 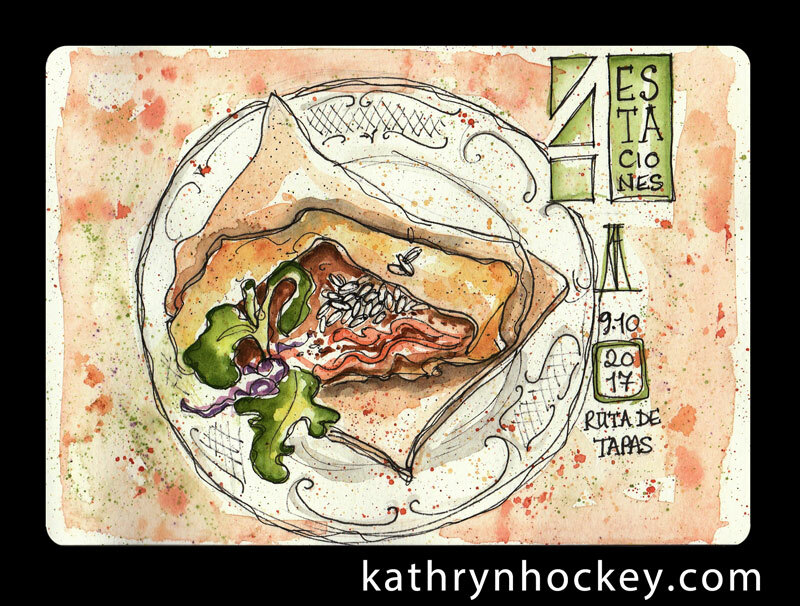 This entry was posted in sketches and tagged 4 estaciones, beef tartar, drawing, fish, food, gamba, illustration, italian restaurant, la posta, langostino, market, mercado de abastos, mercado de san francisco, painting, pasta, pen and wash, pen and watercolour, pueblos mas bonitos de espana, red onion sauce, restaurant, ricotta, roe, ruta de tapas, sketch, sketchbook, spinach, street food, tapas, tapas por vejer, vejer, Vejer de la Frontera, vejer sketchers, watercolor by kathrynhockey. Bookmark the permalink.